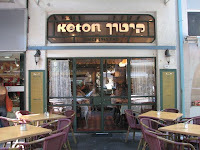 Keton is an East-European Jewish food restaurant that started business in the 40's and kept on being busy all these years until now. It's well known for the poets, writers actors and other old Tel Aviv celebrities who used to eat in this place in the past, and some still do today. And yeah, also known for the good food. In Keton almost everything tastes yummy. You can have a great lunch or dinner by ordering a main dish that comes with two side dishes, or you can start with one of the appetizing starters or soups. The roasted beef is great and also the chicken/fish schnitzel. For dessert you can take a Kigel (some say Kugel) which is a sweet version of a noodles pie which was made by Jews in Europe for Sabbath. 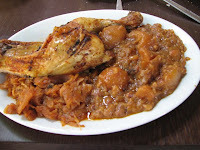 It's on Dizengoff st., on the block that's between Gordon and Ben Gurion st.